Hello! 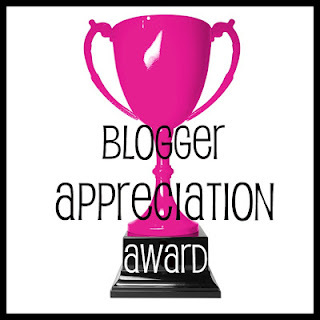 I was tagged by the always lovely Traci from Drinkcitra with the Blogger Appreciation Award! Thank you so very very much!!!!! 2. What are 1-2 reasons why you started blogging. 1. I have been blogging for almost a year now. May will make a year! 2. I started blogging as my hobby! I am so glad I did! 3. I like to read polish, nail art, beauty, makeup and what ever else I find! 4. I think my photography skills need some improvement! Also, my technique. There are so many blogs I love. If your name isn't here, please consider yourselves tagged! Have a wonderful Wednesday! Wow that's so nice of you! Thank you Meredith! Thank you for the award,Meredith.I just got your e-mail,so I will get to it as soon as I can. :-) Thanks again!